Hey Scamps – sounds like a lot of fun. 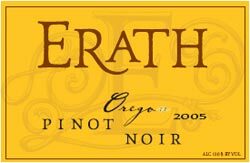 I just tasted my first even Bethel Hts wine last night, and I was really really impressed. It was an 02, Flat Block Reserve. Is Bethel Hts the winery whose original winemaker passed away a year or so ago from cancer? Hey Scamp, get a map….the latitude of the Willamette Valley is roughly the same as the Southern Rhone or Provence….the entire state of Oregon is far south of Burgundy.